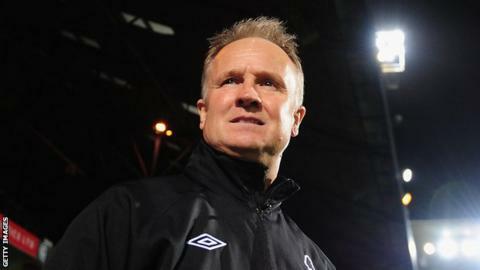 Sean O'Driscoll has been sacked as Nottingham Forest manager after five months in charge at the City Ground. The decision to relieve the 55-year-old of his duties came hours after a 4-2 Championship win against Leeds. "He can count himself unlucky to have lost his job with the team just one point away from the top six," Forest chairman Fawaz Al Hasawi said. Al Hasawi later added on his Twitter account: "Made contact with PL manager tonight. Meeting Thursday." Al Hasawi had earlier declared that Forest would be "looking to bring in an ambitious manager with Premier League experience", stating that "with the January transfer window approaching, we feel it's the right time to make a change". Former Republic of Ireland international O'Driscoll was appointed on 19 July, days after Steve Cotterill was sacked. He leaves Forest with them in eighth place, having collected 36 points from 24 games. In total, Forest won 10 games during his time in charge, drawing nine and losing seven. However, they never won more than two games in a row under him, and Al Hasawi cited that lack of consistency as one of the reasons behind the decision. "We have a responsibility to look to the future for this great club because we have huge ambitions for it," he said. One of the Reds' co-owners, Abdulaziz Al-Hasawi, was at the City Ground on Wednesday for the first time since he and his family took over in July. One can't help but feel that having seen Sean O'Driscoll's Forest play some of their best football of the season in demolishing Leeds that the decision to replace the manager had already been taken. A baffling decision to some with the side so close to the play-offs, but inconsistency appears to have been O'Driscoll's downfall. After recent defeats to Hull and Watford, and a fortunate draw at Brighton, an improved display and win against Leeds couldn't save the likeable O'Driscoll. The owners say they intend to appoint an ambitious manager with Premier League experience, with the likelihood being that someone has already been lined up to replace O'Driscoll. "We knew when we bought the club in the summer that it would take time for the players we bought in to settle but that process has taken longer than we anticipated. "We feel we have developed a really strong squad of players but are still searching for consistency in terms of team performance, underlined by the fact that we have not won more than two games in succession in the Championship this season." O'Driscoll spent five months as first-team coach at Forest at the start of the year, before leaving to take charge of Crawley in May. He was with the League One side for only two months before returning to the City Ground as manager, signing a three-year contract. His task was to build a side capable of challenging for promotion to the Premier League and he made a number of high-profile signings, including Simon Cox from West Bromwich Albion,Henri Lansbury from Arsenal and Billy Sharp on loan from Southampton. Shortly after the news of O'Driscoll's sacking was confirmed, Cox wrote on Twitter: "So we win 4-2 and the manager gets the sack. Gutted for Sean, pleasure to work under. Wonder who will walk through the door next." Sharp also took to Twitter to give his reaction, writing: "Gutted that ruins a decent day."